Ta Prohm HDR, originally uploaded by Cap'n Surly. 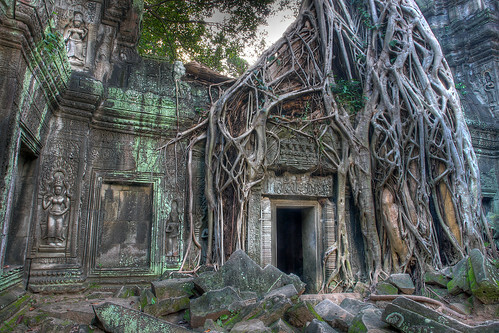 I'm not sure what is more impressive the ancient ruins or the tangled web of tree roots. Most of the he pictures in this blog are images that are listed in Flickr under the "Creative Commons" license for non-commercial use. All of the images are linked to their original Flickr pages where more information and comments can be found. There are also links to the photographers profile page on Flickr. Largest Spanish fir - "Pinsapo de la escalereta"
Tree climbed by one million people! Bizarre tree or accident of Nature? Get the Exploring the World of Trees widget and many other great free widgets at Widgetbox!